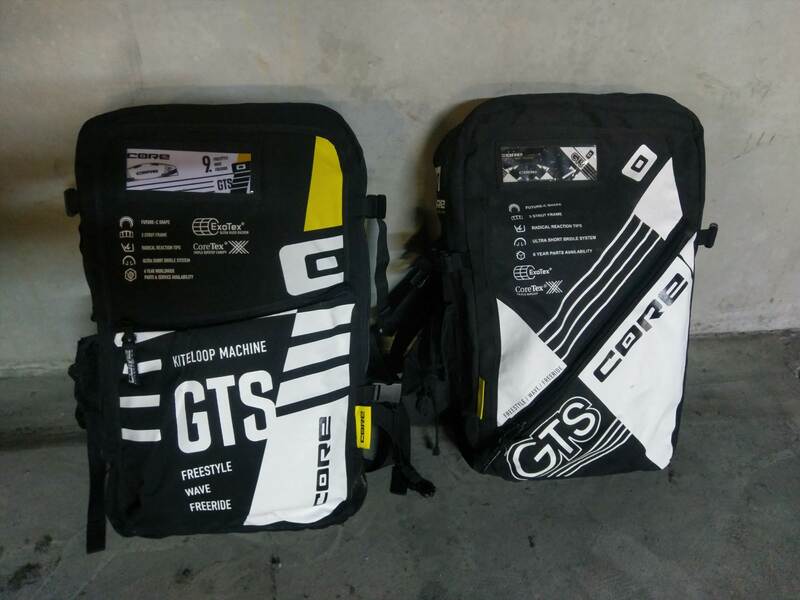 After a huge success with the GTS-4 during the past 2 years, CORE kiteboarding has decided to release the new GTS-5, and we couldn't wait any longer for it. But a few months before, a little baby was born, the NEXUS. Which is a crossover, more delta than C-shape kind of kite. And of course, with such a new comer, we were expecting the GTS-5 to go toward a more aggressive style than the GTS-4 because the GTS is no longer making the bridge between bow and C kites since the NEXUS is born.Even if they've done a huge marketing about the GTS-4 being a "megaloop machine", the GTS-4 was maybe easy to generate low and very controlled kiteloops, but in reality, it didn't have that much grunt compared to some other kites on the market. So now you know, CORE has decided to inject some more horse powers into their new GTS-5. For us this new version of the GTS is basically a GTS-4 with the kick of an Ozone C4 or a Torch for example. But before telling you more about this aspect, let's describe the new beast step by step. First, on the bar nothing changed apart from a second ball stopper installed on the safety line. Then the bag has a bigger front pocket but keeps the same general aspect with the same German quality (I know, I know, the factory is based in Sri Lanka.). 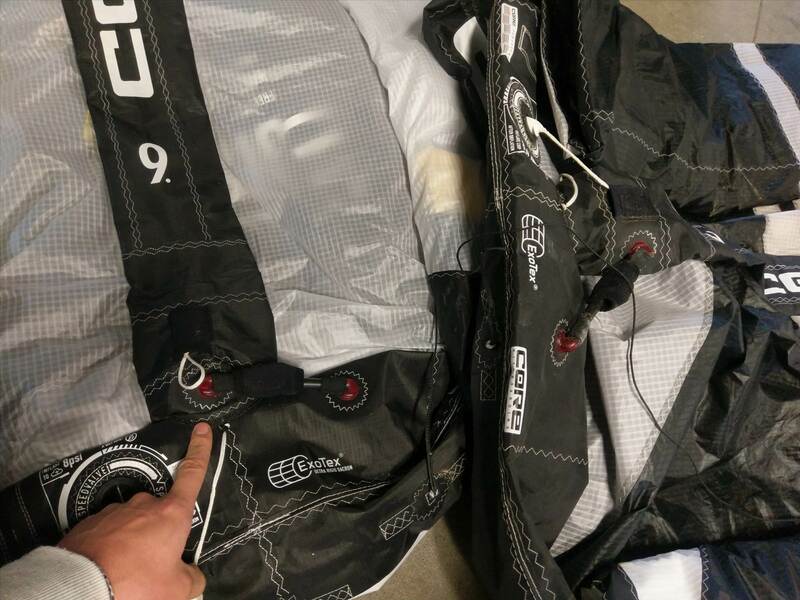 Finally, you unfold the kite and you can see that once again the quality and solid construction are the priorities for the German brand CORE kiteboarding. 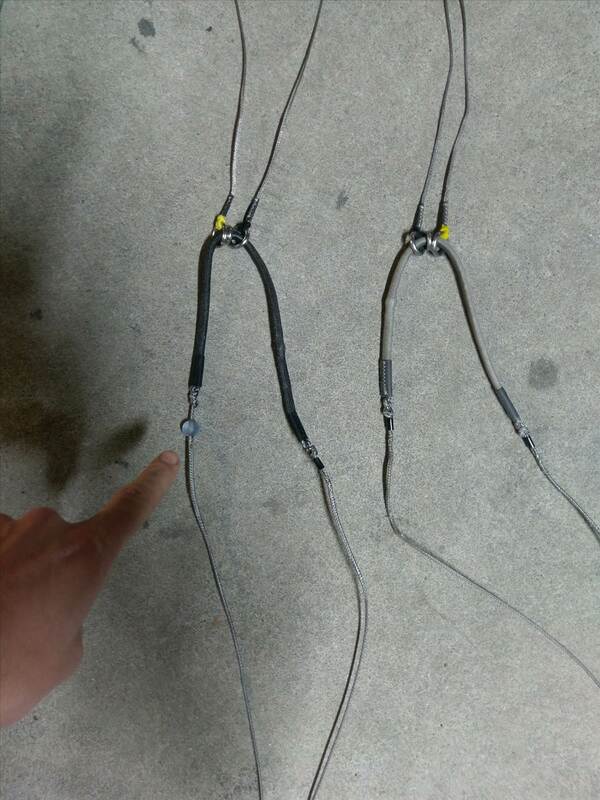 You'll notice a few little changes compared to last year, like shorter strut connectors so they let the air flow normally when you pump up your kite. You'll still have the same three settings on the wing tips (hard bar pressure\medium\lighter) and on the bridles (freestyle\freeride\wave). On the wing tip settings, they actually call them medium\easy\super easy! Waowww! amazing.. sorry to make fun of that marketing description but it would be fairer to let people know straight away that the bar pressure is definitely harder than it was on the GTS-4.Yes, in fact, that's the first thing you'll notice when you launch the kite. The bar pressure is clearly one step higher (at equivalent settings please), and you'll love it if you're looking for a kite with a maximum feedback, but you will obviously be a bit uncomfortable the first time if you are used to lighter bar pressure like on a DICE or an FX. Just to remind you, the harder bar pressure will ask you more commitment but will make you progress much faster on your kite skills, lighter bar pressure is good for very long sessions and focus on your grabs and little movements (pop to blind for example ..). The second change you will notice as soon as you get on the board, is the constant feedback of the kite. You'll know where your kite is at any time. And I'm not talking about the bar pressure giving you more feedback. No, try to remember the first time you tried the GTS-4, there was a tiny area between 10/11am or 1/2pm where the kite would stop giving you a frank feedback, and even more on the GTS-3. We know that after one or two sessions your body gets used to that hole and none of us would notice it again without paying attention, but still, this probably constantly disturbs your timing. But don't worry, this is finished, now you feel the kite flying like if it was your second skin at the very first second you're launching the GTS-5. Your transitions, downloops, and all your jumps will feel really natural. Now you better be ready because the latest generation of CORE GTS is going to make you a ninja. But do you know what the main characteristic of a ninja is? ...whatever they do, they always land softly. For me, the most exciting change about the GTS this year is the kick! Whoever has tried the Ozone C4 probably knows what I am talking about when I say I could spend my entire session doing straight kiteloops, just enjoying the explosive pull of the kite. This is where the GTS-5 is going. For those one that have started to actually move their kite while there're planning up in the air, you probably noticed that the GTS-4 wasn't giving much pull when you would resend the kite forward. Now this new model will give a good kick forward generating more adrenaline in your blood but also, will deliver more hangtime after your kiteloops. Yes, you've heard me right, and on top of that you still have the legendary fast recovery the GTS-4 had after any kiteloops. So now you can loop the kite super low, be certain the kite will catch you, and all the way up to 12 you will feel the kite holding you nicely, still making you traveling really far downwind if you want to keep the kite slightly forward, or you can just send the kite behind you to reduce the speed straight after your kiteloop and go back quickly to your take off zone to jump again. The GTS-4 always gave us the feeling of free falling after a megaloop for 1 or 2 seconds making the hand time a bit poor, or at least the timing to generate the hangtime was more difficult to synchronise, whereas the GTS-5 makes it very instinctive. Unhooking abilities are still the same, which means really good I think. Although I'd say the kite is a little less stable than last year and off course a bit more explosive. But I can't say much about it as it's 5 to 12 degrees in Melbourne at the moment (winter) so I don't want to start saying bull**** that I'm not 100% sure about, just to fill up the review if you know what I mean. All in all, the GTS-5 capitalizes on the strengths of the GTS-4 bringing in a few welcome improvements, although if you like a lighter bar pressure and reduced power you may not find this new version much better that its predecessor. This new version is going toward a more aggressive style that requires a little more commitment, although you still have three different settings on the bridles to make the kite gentler. The relaunch abilities of the kite are still incredibly good, the depower is still great, and the progression of the kite through the wind window is even more instinctive than the GTS-4 was. 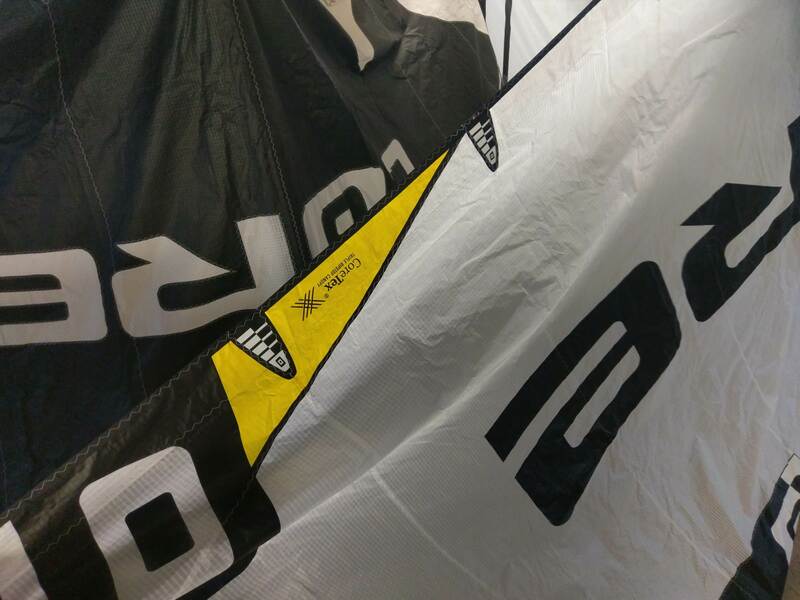 As always, the feel you get from a kite is very personal, so go ahead and try it at least 1 hour to get used to it and give yourself a descent opinion about this new kite. Personally, this evolution suits better what I am looking for in a kite. My favourite set up is freestyle setting + middle setting on the wingtip (called "easy"), and I used to ride the GTS-4 on freestyle setting + furthest setting from the wingtip (called "medium"). 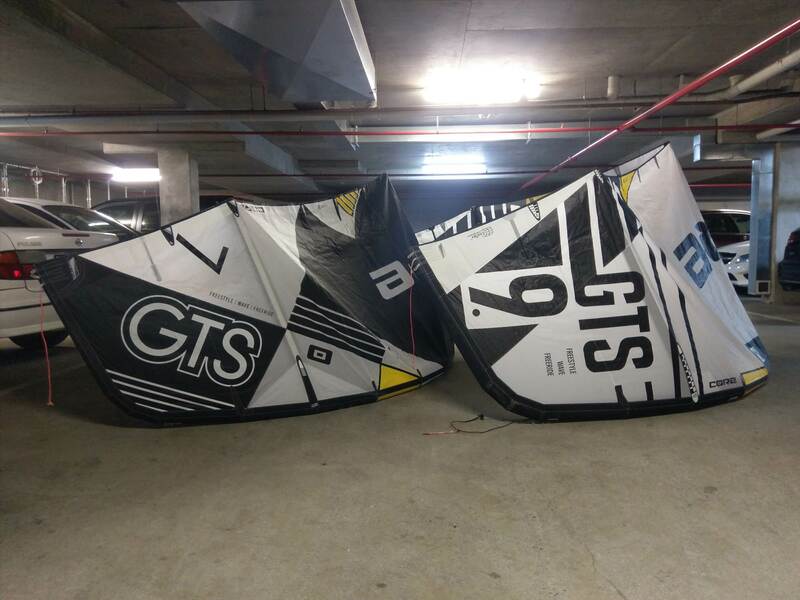 We hope this will help you to choose between the NEXUS, XR5 and GTS-5 and the other kites of the market as it's never easy to make a choice since all the manufacturer\big shops reviews look all the same. Please let us know what you think. Toby, this sounds like your cup of tea!!! Wow, this sounds impressive for TT riders !!! I demoed the 11m GTS5, never tried previous versions. I was surprised by the light bar pressure and bar feel, not sure what setting it was on but was quite light. It would takes some time to adjust. Another thing about the bar is that if you push it out a few inch you loose power very quickly, I guess that's a good feature but it killed power even faster than my 5 line Best GP C kite. A bit more like the Torch actually which also has very small bar throw. Anyway I think that's probalby a good feature when you want to go very powered but it takes a bit of time to adjust. The kite was great though, i can't believe how fast it is for 11m, conditions were choppy but because kite was so fast it was fairly easy to send it right on a piece of chop. Wind wasn't that strong and it sent you straight up with nice yank and the landing loop had a lot of lift and hangtime. 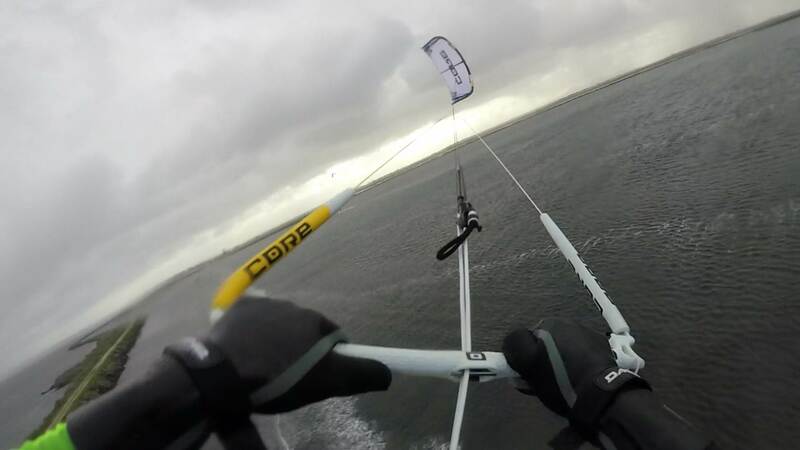 I tried a few powerered kiteloop and the kite caught me nicely actually, which is great for 11m considering the choppy conditions. Thank you for the detailed review Pilgrimagga. I contacted Core as well as the riders and I didn't much feedback on the new GTS. I'll report back if I also get a go on it. Would you say the low-end and its lift has improved a little? I'm coming from the Torch and I'm looking for better low-end and lift as well as I'm increasingly more going for big air moves. The GTS-3 had a poor low end but the GTS-4 was as good as any other C-style bridled. I was going with my 80 kg, short board and boots in 15-20 knots on a the 10m. And the GTS-5 has the same low end as the GTS-4 for me. About the lift it's hard to say, I think every kite can jump 20 meters to be honest, but for me the question is which one has got the easy timing and which one has got the explosive pull. The reason why I sold my Cabrinha 2018 gear 3 months after buying it last year was the super easy timing on the GTS-4, And I think the GTS-5 still got it when you are on the right settings. The kite sizes make a fair difference but it depend what you are used to also. In my opinion you were using the kite on the middle settings on the tips and bridles. That's the beauty of the gts ( and most C-style bridle kite). You can truly change the kite behavior by moving the knots\attachments. Go 9m ! it's the best size !!! Pretty sure Toby would crash and burn every single trick he tried on this kite. I would like to try the g5. G4 had absolutely no pull in the loop. Complete lack of balls....Adding balls will probably scare the previous core loopers away after they finally understand what a loop is.